While email marketing is obviously a great strategy every business should have, there’s an element of the personal touch that’s completely lacking. Expanding your marketing strategies is a good idea if you want to reach your customer base off the screen where a personal connection can be made. Sending out real hold-in-your-hand business greeting cards is a great way to do just that. Luckily sending out really nice personal snail mail can be as easy as sending an email. Using digital tools available via Postable to create and mail something with a personal touch is a great way to build real life relationships that marketing emails simply cannot achieve. In the age of full inboxes and empty [snail] mail boxes, sending out personal business birthday cards is a no brainer. If you’re not already mailing your customer & employee base business birthday cards, you really should be. A stellar way to boost employee moral along with a simple way of showing your appreciation, birthday cards for employees are also a great way to build community within your company or organization. Luckily, just like automating emails has become a total breeze– automating your business birthday cards is just as easy. All you have to do is import a spreadsheet, customize the design of your business birthday cards (using your logo is a great branding opportunity), apply a master message and voila! 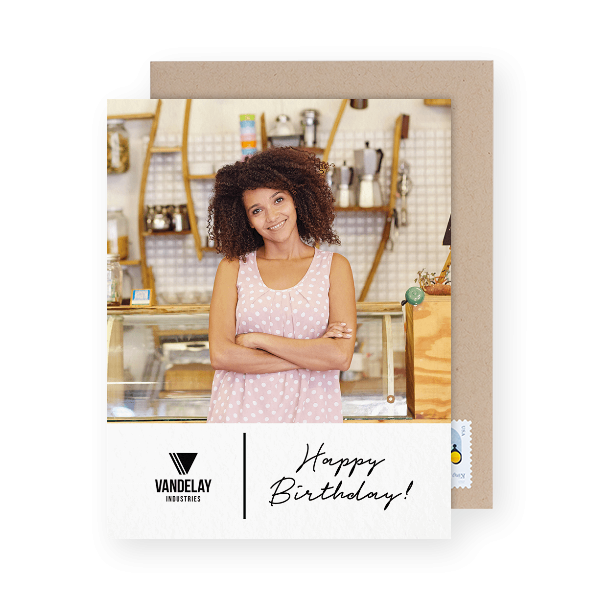 Each one of the birthday cards will be scheduled for you so that they’re individually mailed out just in time for each one of your customers’ and employees’ birthdays. Adding new recipients is just as easy with online tools and helpful assistance right at your fingertips. 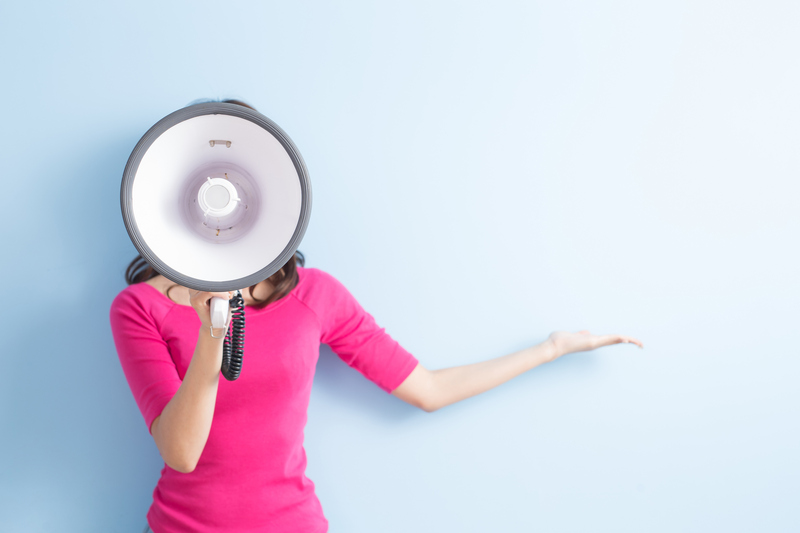 If you’re still unsure that this marketing tactic is the way to go, we’ve got 5 stellar reasons to help make up your mind. This marketing strategy is kind of a no brainer and here’s why. According to a report by Frederick Reichheld of Bain & Company, the cost of customer acquisition versus customer retention could reach as high as 700%. So while you’ll obviously still need to acquire new customers, why not up your game with your customer retention tactics? You got them in the door (or onto your site) and you even made a sale — the opportunity for long-term customer relations is already there, all you have to do is continue to build on that foundation. One of the easiest ways to do this is business birthday cards. 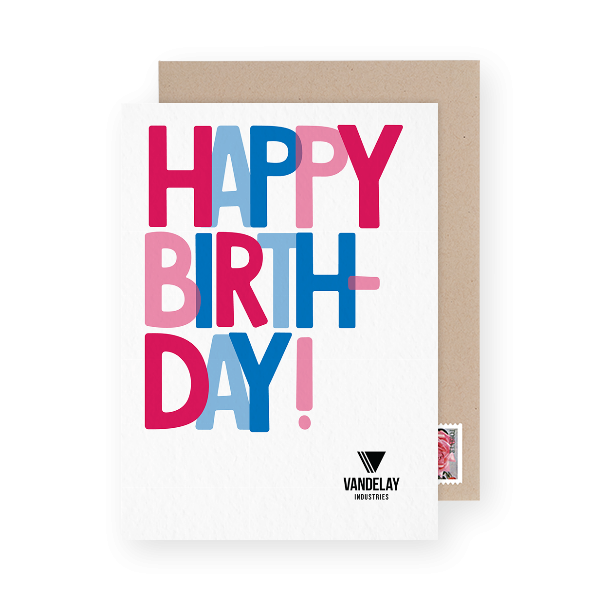 Sending your customers a personal handwritten birthday card makes them feel special. Who wouldn’t want to feel special? Make the message personal by using the customer’s first name (don’t worry, you can automate this feature as well). When was the last time a company (of any size) mailed you a *nice handwritten birthday card? It’s not likely that you even remember. 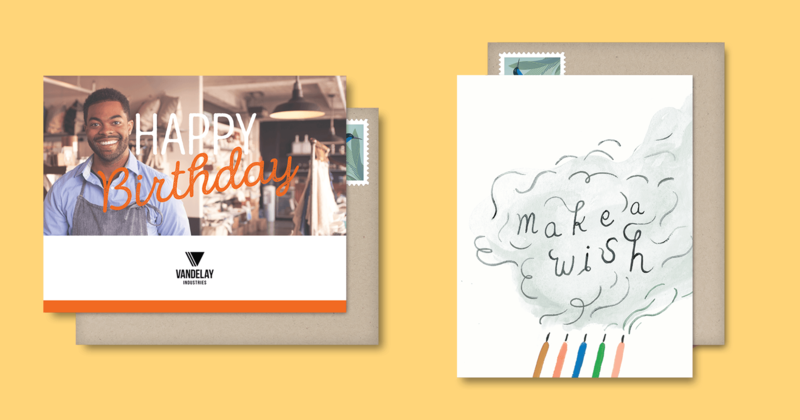 When your customers receive your birthday card on their special day, they’re probably going to be pretty woo-d and will likely share their surprise with someone they know. By sending your customers something special and personal you’re almost guaranteed to surprise them. Not only are you building a customer loyalty with your existing base, but you’re also getting a few referrals sent your way. For e-ccomerce businesses or companies whose only interaction with their customer base is digital — the personal touch is non-existent, but oh so important. If your business is online, you aren’t getting the same benefits of interacting with your customer base face to face. That one on one interaction that often results in customer retention is missing. This is where the business birthday card (or really any personal handwritten card) comes in. By mailing out a personal note to your customer base on their special day you’re taking your online business into the physical world where the sentiment can be felt. Connect with your customer base on a whole new level by sending them a little something on their special day. Your business is only as successful as your employees. Sending business birthday cards to your employees not only lets them know that they’re important, it totally boosts the workplace moral. It lets them know that their boss was thinking about them before their birthday ever arrived — making the card so much more special. You can also choose to include a gift card inside the cards to your employees to put your money where your appreciation is. When you boil marketing down to it’s core — branding is really what’s left. Aside from having a personal touch and eliciting an emotional response, business birthday cards are a great opportunity for getting your brand in front of your customers. Sure, you can place your online ads with retargeting and send out marketing emails galore, but getting your brand in front of a customer who’s only attention is your logo is not an opportunity you want to miss. Aside from having your logo on the front of your card (which is hard to miss), branding has a great deal to do with your voice and how you choose to say ‘Happy Birthday’. Business birthday cards are an opportunity for you to get customers a better feel for your brand. What does your company stand for? What’s the company’s personality and approach to it’s customer base? This is your opportunity for your brand to really shine. Make your message personal and make sure to keep the same ‘voice’ in the message as you do with all of your other messaging. These five reasons to send business birthday cards are pretty applicable to just about any business greeting cards. If you’re already mailing out a little something for your customers on their birthday, make sure to you’re not missing out on other snail mail occasions. There are many great opportunities to touch reach out to your customer base using personal handwritten cards [see: 7 print marketing use cases to make your real estate business stand out]. Postable’s selection of business logo cards are all completely customizable on the front and you’ll be able to write whatever you’d like on the inside. See Postable’s Business Tools here for an outline of the tools to make your snail-mailing life easier. Remember, if you ever need any assistance — feel free to email info@postable.com.